Today, I turned on my PC to find that I'm stuck with that 100% disk usage problem, which actually makes it run like a complete potato. I found some solutions that worked but there is a problem with that Microsoft content app that keeps ramping up my disk usage to 100% whenever it randomly decides to pop up. The other one was the "Windows search" app which I turned off through "services.msc". Where do I turned it off permanently? This is the name of the app when I go into the details section. where the location of the app? Yes, disk is at 100% but that app is showing as using .1mb and yet its sorted in usage? Win 10 1809 did have a problem showing correct usage of processes, but I am fairly sure that is fixed now. Do you have latest windows updates? Download Process explorer and run it as admin (it comes from Microsoft so its safe) - its just a more powerful version of Task manager, shows WAY more info than you need. the default view is tree structure meaning like your task manager screen, it will show what processes are under each service, but unlike task manager, it shows the usage of each part so you can see what is eating your hdd but we will need to add a few columns first. once you choose, click OK and the columns will be added to far right of the window, I would drag them to the left so you can see it all. Needs to be run as admin to see hidden system processes. Yes, I understand it doesn't make any sense, but that's it. The moment I click "end task" on that app my PC goes back to full power with 0% disk usage and has no problems with anything else. It will randomly decide to pop up throughout the day and I have to manually shut it down every time, if I want to use my PC. I have also waited for the app to do it's thing but it never goes down, it stays on 100% disk usage whenever it comes back. I don't think it has to do anything with the motherboard, because then wouldn't I have more than just that one app causing the problem? There was a win update somewhere a week ago I think. I never experienced this problem before that. In Process explorer, the app appears to be lower in the column and has the name of the details section in task manager "backgroundTaskHost.exe"
This is what it looks like. 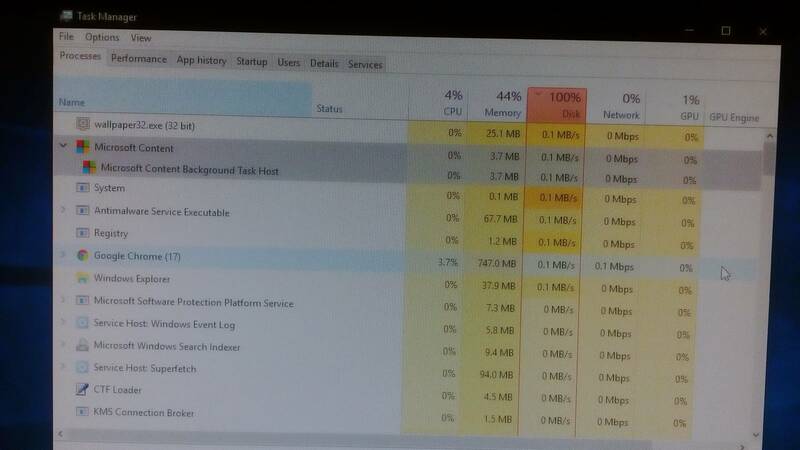 Killing it in Process explorer has the same results as if in task manager. it seems its part of Cortana. I can't find another example of it causing high hdd usage. I don't think background task host is the same file as Microsoft content background task host... i can find a few background hosts, there is also one for Edge. Yea, I disabled cortana but it wasn't the problem. I went to check my windows version and I saw I was on 1803ver... I thought I'm on the latest one as I was getting updates here and there but I wasn't. I manually checked for updates and there they were. I updated to the latest I think and everything is working fine now. The app is still running in the background but not causing my PC to go to 100% disk usage. Thanks for the help anyway!!! Windows 10 updates messed up my PC and wasted full day trying to recover! I WANT IT PERMANENTLY DISABLED!!! PLZ HELP!! Is there a way to permanently disable Windows 10 background processes with Task Manager?